Coccoloba is often referred to by Nevisians as having “the best view in Nevis”. Featured in Caribbean Travel and Life, The Sunday Times, The Guardian, LIAT magazine and Nevis Tourism brochures it is a show case of how modern architecture, materials and living can embrace traditional Caribbean design principles. Completed in 2008, Coccoloba really is a sight to behold. A West Indian hip-shaped roof sits above plantation style teak verandahs covering an area of 3,420 sq ft. In addition there is an enormous pool allowing 54’ laps and providing a stunning 21’ infinity edge. Adjoining the pool is a further 1000 sq ft of soft Jerusalem limestone deck. 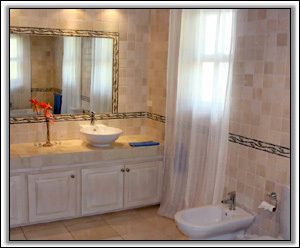 The whole property oozes simple clean lines and open spacious living areas. 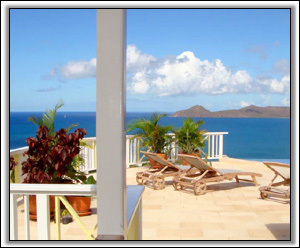 Walk through Coccoloba’s front door and the first thing you notice is a breathtaking view of St. Kitts. Thirty two feet of bifold glass doors open up from the Great Room to give unobstructed views across the infinity edge pool, over ‘The Narrows’ and on to St. Kitts. You can even see St. Barts on a clear day! The kitchen and great room are open plan with honed limestone flooring, cypress vaulted ceiling, comfortable soft furnishings and every appliance needed for a modern kitchen. 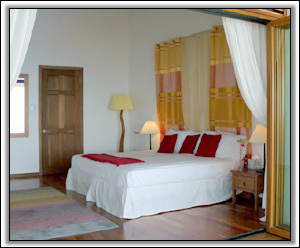 In the Great Room there is also Wi-Fi broadband internet, telephone, Apple Hi Fi with iPod docking, TV and DVD player. 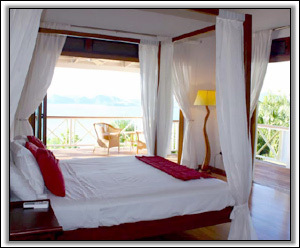 The villa is surrounded on all four sides with beautiful Trinidadian teak decked verandahs. The west verandah is 14’ deep by 72’ long with dining table, sofa, chairs and chaise lounge. Watching the sunset from this elevation of 270’ is amazing, especially when you are treated with the famous ‘green flash’. You will also find that the elevation deters the mosquitoes that are usually found at sea level. Wake up in the king sized teak four poster in the master bedroom and gaze over your feet through the 8’ glass doors at the Atlantic Sea. Turn your head to the left and look through another 10’ opening at the Caribbean Sea and the rising sun lighting up St. Kitts. 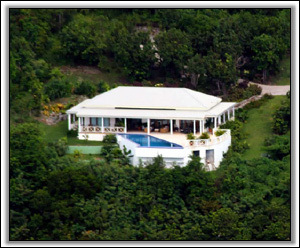 The villa appears to hang on the edge of a hill overlooking Oualie Bay. It is set in 33,000 sq ft of landscaped garden at the end of a private road. Sitting back from the main island road and benefitting from the omission of adjoining neighbours, Coccoloba enjoys peacefulness and serenity. Turn off the verandah lights at night and watch the fireflies dance through the Coccoloba (Latin for Seagrape). Coccoloba is perfectly located for enjoying the best of Nevis. Lover’s Beach, Oualie Beach, Tamarind Bay, Cades Bay and Pinney’s Beach are all within two miles. A great choice of restaurants including Gallipot, Mount Nevis, Miss June’s, Oualie Beach Hotel, Coconut Grove and Yachtsman’s Grill are also on the doorstep. Oualie Bay provides water sports including scuba diving, yacht charter, sailing, kayaking, snorkeling, deep sea fishing and wind surfing. 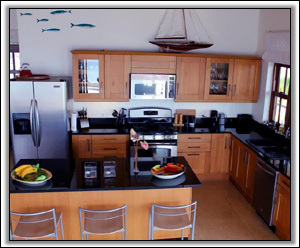 Take a water taxi over to St. Kitts and enjoy a meal at Beach House or Spice Mill. 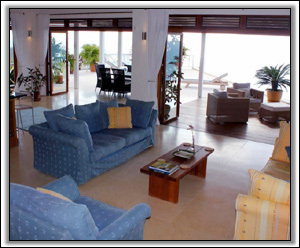 All that Oualie Bay offers within a 10 minute walk. 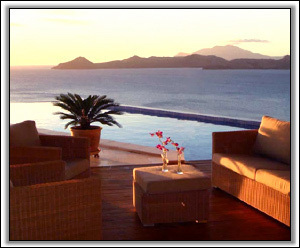 Coccoloba is that special spot in the Caribbean that will help fulfill all your holiday dreams.